Seattle Opera Blog: Tenors, Sopranos, Naughty Druids—oh my! Tenors, Sopranos, Naughty Druids—oh my! 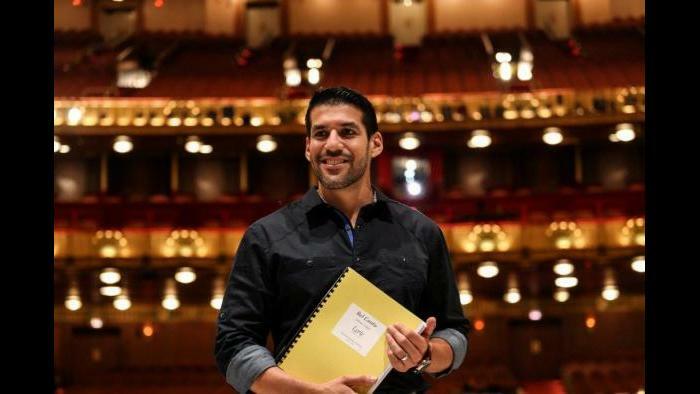 Monday night, December 7, will be a big night at Lyric Opera of Chicago: it’s the world premiere of Bel Canto, the new opera by Jimmy López (above), with a libretto by Nilo Cruz based on the popular novel by Ann Patchett. The high-powered cast features Seattle Opera’s beloved Andrew Stenson as the young translator, Gen, held hostage in a palace in Lima, Peru (home of William Burden, who plays the Peruvian vice-president) with a Japanese mogul, the American opera singer he loves, and a band of guerrillas (among them countertenor Anthony Roth Costanzo, our Oberon in Midsummer Night’s Dream a few years ago). Fond wishes for a great opening to Director Kevin Newbury, who makes his Seattle Opera debut in February with Mary Stuart, and Lighting Designer Duane Schuler, who comes home to Seattle to light The Marriage of Figaro in a few weeks. Meanwhile, in Zurich, soprano Serena Farnocchia, who makes her Seattle Opera debut as Mary Stuart in February, opens her run of performances of Rossini’s curious opera Il viaggio a Reims on Sunday. Rossini wrote this opera for a once-in-a-lifetime occasion in 1825 starring fourteen of the world’s greatest singers. Anticipating that it would never be performed again, he adapted much of the music to his delightful French comedy of 1828, Le comte Ory. Here she is (above) singing in a rather interesting looking Butterfly. Colin, center, in Opera Atelier's Armide. Bruce Zinger photo. Meanwhile, Canadian tenor Colin Ainsworth—coming to Seattle next May to sing the Steersman in The Flying Dutchman—just had a remarkable experience singing Renaud, the hero of Lully’s Armide, at the Château de Versailles. This rarely-performed tragédie lyrique is about as far as you can get from Wagner; Mr. Ainsworth is a versatile singer and cut a dashing figure as the chivalric hero Renaud (see above). Elsewhere in Swizterland, the Grand Théâtre de Genève has just closed their first-ever production of Britten’s A Midsummer Night’s Dream, which left critics reaching for superlatives. Slovenian soprano Bernarda Bobro, who makes her Seattle debut as Countess Almaviva in our upcoming Marriage of Figaro, earned raves as the Fairy Queen Tytania; among the mortals who got trapped in her enchanted forest was Mary Feminear (Helena), who sang Semele at Seattle Opera last spring. Get a taste of the show with this trailer. Russell Thomas and Jamie Barton in LA Opera's Norma (left) and then in Seattle Opera's Nabucco.